Let's say humans moved to Mars and have lived there for millions of years. Mars is of now uninhabitable, though in this case some terraforming has happened. The poles have been nuked to release greenhouse gases and a prosthetic magnetic field has been created, and also an ozone layer. The hows are not important. So, Mars is warm enough for humans, actually quite a lot warmer than on Earth today, and a weak and spotty ozone layer protects from UV-radiation. But not as much as Earth. The UV radiation is that of Earth's equator, just amplified quite a bit. This is due to the low resources going into the project, as the move to Mars happened in a drastic time of war on Earth, meaning they couldn't spend much time perfecting the terraforming process and outcome. Now that all those details are out of the way, this is the product of my research: I know these martians would be a little taller than the average earthling human. Their skin would also be coal black, along with their hair and their eyes, due to the amplified melanin production to protect against the UV-radiation. I also know they'd be just a little weaker, unless for some reason their diet was more protein filled than that of ours today. So, how else would these Martians be different? What more would the conditions on Mars change about the human body? The obvious modifications would be reduced bone & muscle-mass due to lower gravity stress. Reduced solar radiation probably drives a lightening of the skin to produce vitamin D, so the people would become paler compared to earthlings. Blood hemoglobin counts would vary inversely with whatever atmospheric oxygen level is established, just as happens with altitude on earth. To the extent that cosmic radiation is permitted thru the atmosphere, within a narrow limit, there would be selection pressure for resistance to skin cancers, perhaps with a thickening of the epidermis layer. Blue/green eyes might also be selected for in a lower light environment. Another less predictable modification might be those associated with efficient locomotion in a lower-g environment, where a lower cg might be favored. This would only be germane under an 'in the wild' selection environment, though grace/agility has potential for sexual selection. I doubt the coal black skin color hypothesis for two reasons. Damaging radiation on Mars is going to come from sources other than UV. Mars is 1.5 times farther from Sol than Earth; by the inverse square law, UV radiation will be 2.3 times less than on Earth. On the other hand, Mars' high background radiation, and periodic spikes of deadly radiation, comes from high energy particles. When these particles interact with the atmosphere or surface or your body, they will emit a wide spectrum of EM radiation as the high energy cosmic ray particles are lose energy through collisions. Second, the overall dose on Mars is too high for humans, as they currently exist, to survive. 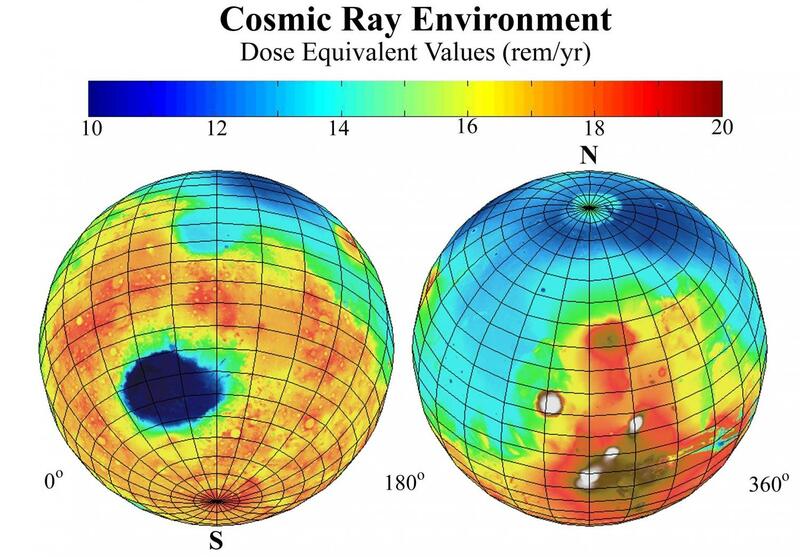 As seen the picture above, pretty much the entire planet sees at least 10 rem/year from cosmic rays. The legal limit for radiation workers in the US is 5 rem/year. Other potential bad news is that While 10 rem/year isn't necessarily deadly, no one has ever been exposed to a chronic dose of that intensity. It is debatable if or how fast this exposure would cause cancer, and also debatable how well/if at all reproduction would work. For comparison, the legal limit for pregnant women is 0.5 rad during a 9 month pregnancy; Mars would exceed that by a factor of over 10. Conclusion is, people would not be living outside on Mars. They would be living in radiation shelters. And, if they are living in radiation shelters, there is no evolutionary pressure driving towards coal black skin. There is evidence that the skin color gradient on Earth is driven by sexual selection. There is evidence in that linked paper, that men prefer to mate with women who have a lighter skin color. The skin color preference is noted within society groups; that is, men prefer women who are lighter skinned than average in their society, not that men universally prefer Finnish women. The paper concludes that the gradient in skin colors on Earth is caused by a mixture of factors: skin color preference against the biological advantage of dark skin for UV protection. Given the last point showed that UV expose of Martians is likely to be very low, because of living in radiation shielded environments, I would suggest that skin color is likely to be driven to Finnish white by sexual selection, since there will be no UV related advantage to skin color. Not the answer you're looking for? Browse other questions tagged planets evolution humans mars or ask your own question. What would push a civilization to terraform a planet considering the complexity of this process? How could humans survive on Mars for 365 days? What would a completely terraformed Mars look/behave like? How many people would it take to colonize Mars?